The Rider Book of Lists was born on a dinner napkin during the Saskatchewan Roughriders’ thrilling 2009 Grey Cup run as a way of honouring the team’s 100th anniversary in 2010. Authors Sheldon Green and Rod Nasewich quickly realized that the Riders’ rich history presented a wealth of material with which to create a unique, informative and engaging book that appeals to both the casual fan and the statistical enthusiast. Two first-time authors who have each spent more than 40 years watching, hearing about, and cheering for the Riders, Sheldon Green and Rod Nasewich felt the compilation of 100 lists of Saskatchewan Roughrider team and player statistics, record holders, award winners and pop culture trivia was a unique way to celebrate and commemorate the team’s centennial in 2010. The Rider Book of Lists provides a different and sometimes off-beat look at the Riders as a team, organization and as a pop-culture phenomenon. 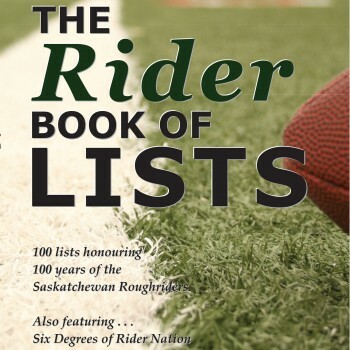 The book’s 100 lists cover statistics and trivia intended to appeal to all generations of Rider fans and statistical enthusiasts. A sampling of lists includes: 50 great Rider nicknames, the top 18 Rider quarterbacks, Labour Day Classic stats, Riders who became sportscasters, Saskatchewan-born Riders, Rider opponents of the past, beer sales at Mosaic Stadium, stadiums in which the Roughriders will not play again, Riders who appeared in movies and on television, and 13 things you may not know about Gainer the gopher. For example, did you know one of the longest serving Rider head coaches was banished from the NFL for allegedly taking a bribe, or that it was a Rider who threw the first forward pass in a Grey Cup game? Did you know George Reed still holds at least six CFL rushing records, and that the Riders were the visiting team of record for the largest regular season crowds in both Edmonton and Winnipeg? Did you know the Roughriders appeared in an episode of TV’s Columbo? The book also debuts a fun diversion called ‘Six Degrees of Rider Nation’ to explore the connection between the Riders and famous people including Elvis, Oprah, Jerry Seinfeld, JFK and Queen Elizabeth.